The Ashaway Supernick XL Titanium is a powerful and durable squash string. 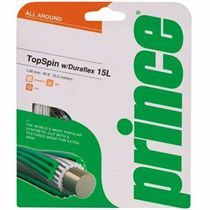 It features titanium additive in nylon resin wear layer for increased durability, multifilament construction for gut-like performance, and textured surface ensuring optimum ball control. The string is recommended for players seeking superior combination of playability and durability. It features 1.25mm gauge and is 9 metres long. for submitting product information about Ashaway Supernick XL Titanium Squash String - 9m set We aim to answer all questions within 2-3 days. 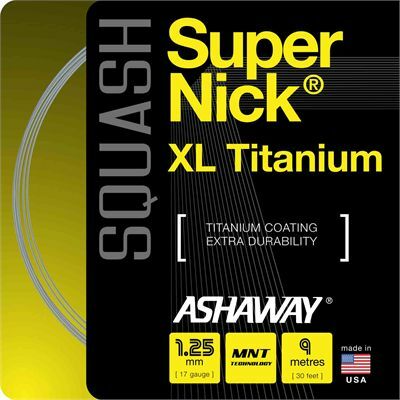 for submitting product information about Ashaway Supernick XL Titanium Squash String - 9m set. We aim to answer all questions within 2-3 days. If you provided your name and email address, we will email you as soon as the answer is published. for submitting product review about Ashaway Supernick XL Titanium Squash String - 9m set.